Steel company Caparo Industries is cutting 452 jobs across its UK sites after going into administration earlier this month. More than 300 jobs are being lost at plants in the West Midlands, with other losses at sites in Hartlepool, Wrexham and Tredegar, administrator PWC said. Unions blame cheap steel imports for Caparo’s financial problems. A number of sites have closed with immediate effect and more jobs are expected to go in the coming weeks. A skeleton staff will remain at some of the sites to shut them down over a period understood to be a matter of weeks, before they also lose their jobs. Vehicle technology divisions Caparo Forging Europe at Dudley, West Midlands, and Hartlepool in Teesside and the Caparo Atlas Fastenings business at Darlaston, also in the West Midlands, have shut. 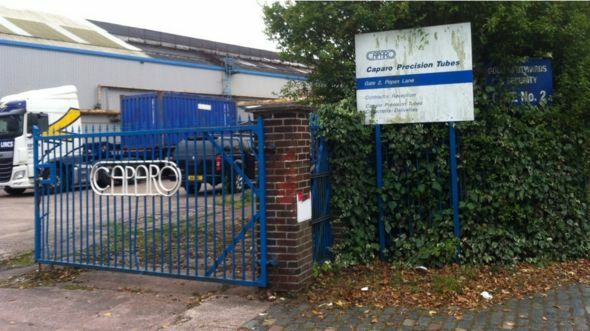 Also closing down is the steel products division Fairbright Wire & Caparo Tubes in Tredegar, Blaenau Gwent. Thousands of job losses have been announced in the steel sector in recent weeks, with the collapse of SSI in Redcar, Cleveland, and cutbacks at Tata Steel in North Lincolnshire and in Lanarkshire. Paul Wood, who has worked at Caparo Forging, in Netherton, Dudley, for nine years said he was called to a meeting during the morning at which he was told he would lose his job. He said he was “devastated”. The Netherton foundry has been there for a century and makes gears for Volvo lorries and Scania lorries. Reblogged this on Isle of Wight TUC.